Show your family you love them with our Strawberry Heart Pillows recipe. 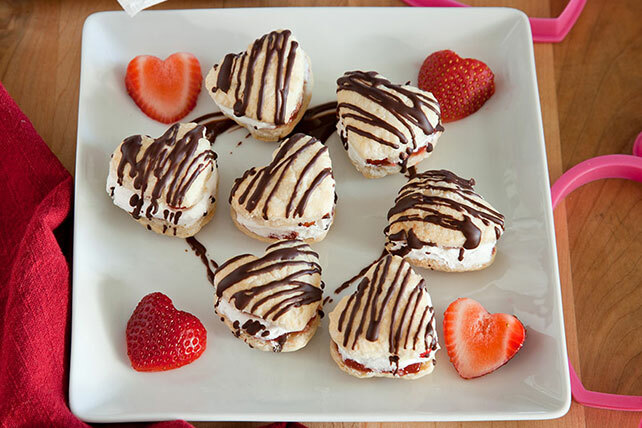 These tasty Strawberry Heart Pillows are drizzled with melted chocolate. Unfold pastry. Cut into 16 hearts with 2-inch heart-shaped cookie cutter. Place on baking sheet. Bake 20 min. or until golden brown. Remove to wire racks; cool completely. Cut each heart horizontally in half. Spread 1 tsp. jam onto bottom half of each heart; top with 1 Tbsp. COOL WHIP and a strawberry slice. Cover with tops of hearts. Drizzle with chocolate. Place 1 oz. chocolate in microwaveable bowl. Microwave on HIGH 1 min., stirring after 30 sec. Stir until chocolate is completely melted. Pour into small resealable bag; seal bag. Snip off one bottom corner of bag; twist top of bag to drizzle chocolate over dessert as desired. Place unopened 8-oz. tub COOL WHIP in refrigerator for 4 hours. Do not thaw in the microwave. Serve immediately. Or, cover and refrigerate up to 1 hour.